Stay focused and keep your business moving forward with high-quality presentations that engage audiences without straining your budget. 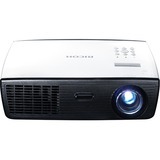 Choose the compact Ricoh PJ S2130 to bring presentations, videos, and movies to life in small classrooms and conference rooms. This entry-level system combines innovative image projection technology, easy-to-use functionality and convenient flexibility for exceptional value in a portable, lightweight design. Add it to your fleet of business communication systems with confidence - knowing it's backed by world-class service and support from a partner you can trust.